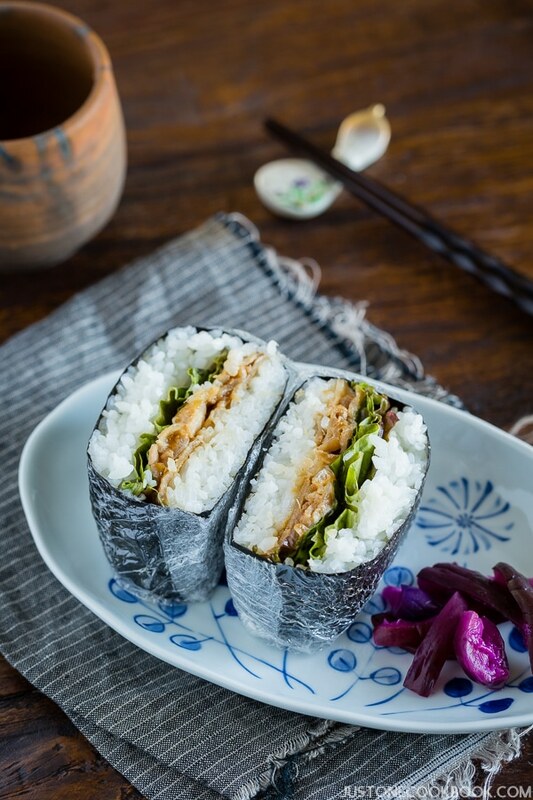 Today’s lunch menu: Ginger Pork Onigirazu (豚の生姜焼きおにぎらず) – tender thin pork slices with a hint of ginger wrapped between layers of rice and nori! 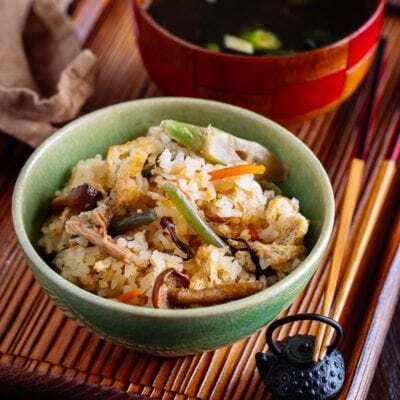 The new school year has started and if you need new inspiration for what to pack for yourself or your children, try this easy and flavorful Ginger Pork Onigirazu (豚の生姜焼きおにぎらず) in your lunch menu routine! 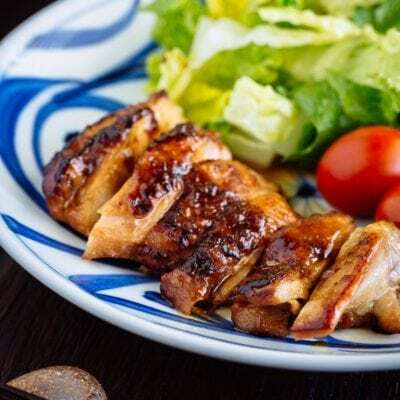 Ginger Pork or Buta no Shogayaki (豚の生姜焼き) is a Japanese dish that is often made at home or enjoyed at Teishoku-ya (lunch set menu restaurant) in Japan. 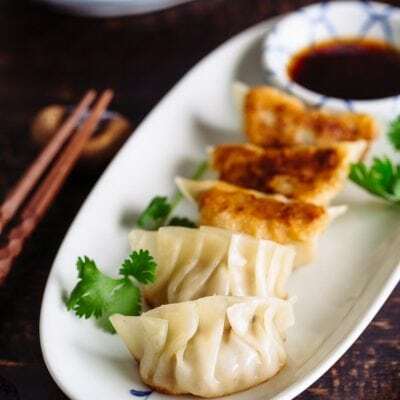 This dish might be new to you as it’s not as well-known as Japanese Teriyaki dishes, so your local Japanese restaurants might not offer this on their menu. 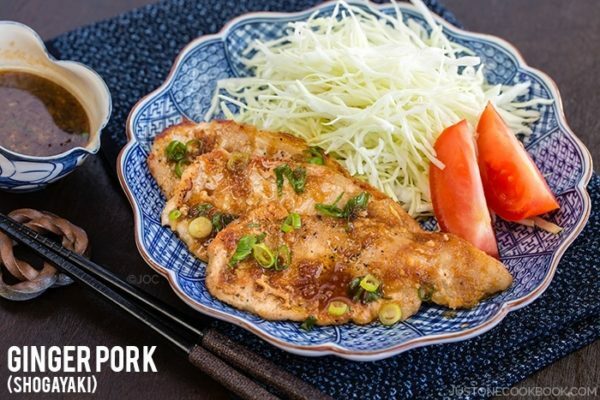 However, if you love ginger and soft tender pork slices, I guarantee you’ll love this dish. It’s such an easy and quick dish to make for your busy weekday nights. 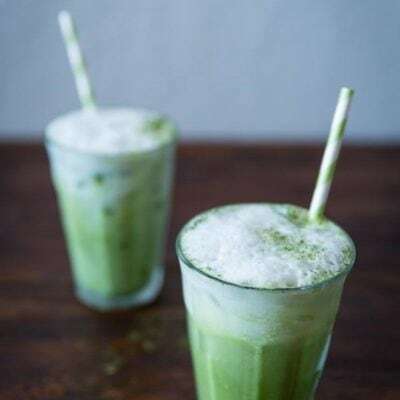 If you are not a fan of ginger, you can reduce the amount (use just a hint of it). Please take a look at my Ginger Pork recipe for inspirations. Onigirazu is a rice ball (onigiri or omusubi in Japanese) that is not formed into the traditional round or triangle shape. It is usually a square or rectangular shape. 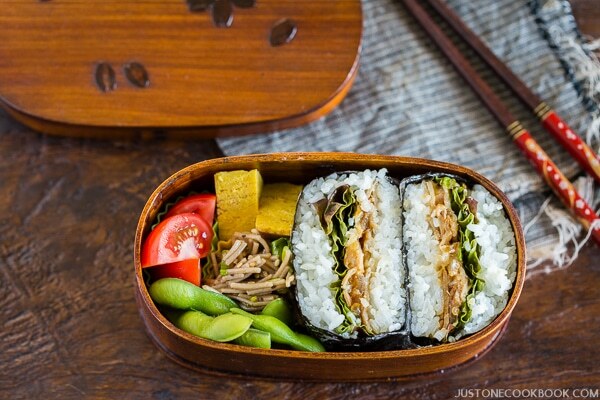 You “sandwich” the savory fillings with steamed rice, just like how you would make a sandwich with 2 pieces of bread. 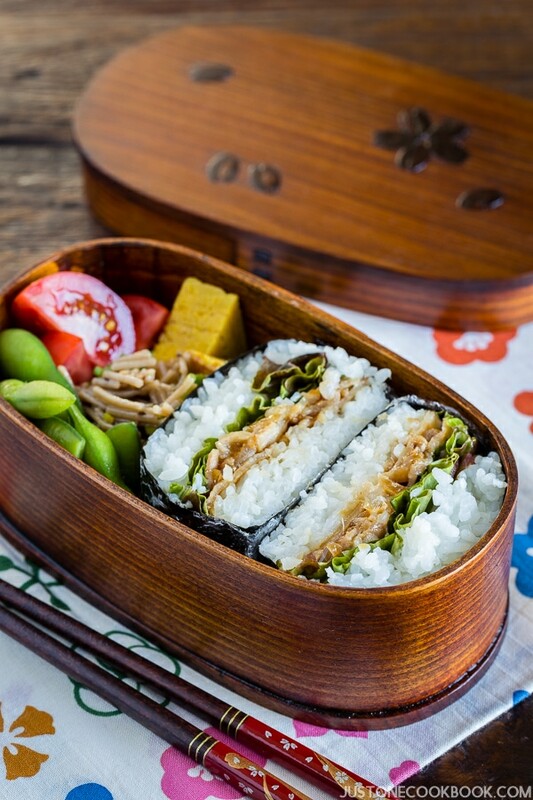 Unlike traditional ongiri or omusubi, you can put more fillings inside onigirazu than traditional rice balls as the shape is square/rectangular. You can also spread the fillings just like how you lay them out for a sandwich. 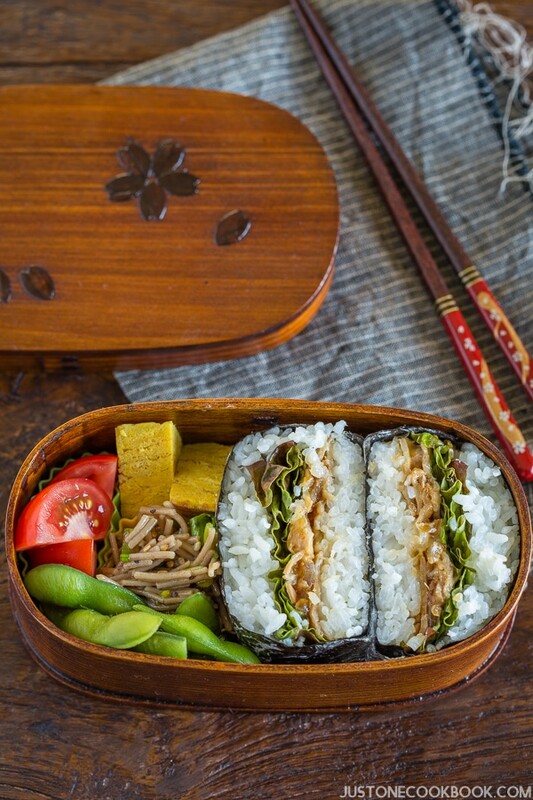 After you make the rice sandwich, you wrap it up with a sheet of nori and cut it in half to serve or pack in your lunch box (I use Magewappa – you can purchase a similar one here). 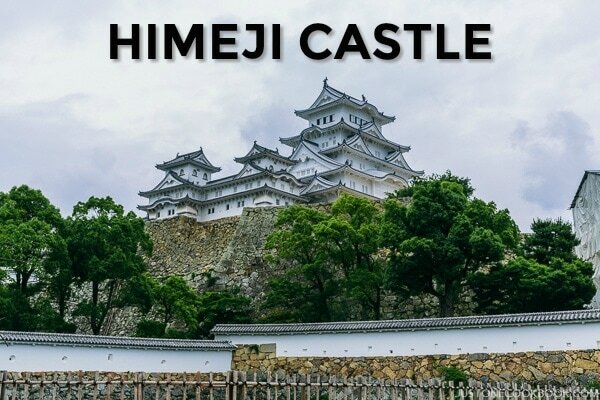 If you want to learn more about onigirazu and its origin/history, please read this post. Many of you have asked me about my wooden onigirazu mold. This beautiful mold was a gift from Mark, a JOC reader from Oregon. He handcrafted this mold with Port Orford cedar and there is not a single nail used in this mold! For those of you who are interested in this mold, please check out his Etsy page! 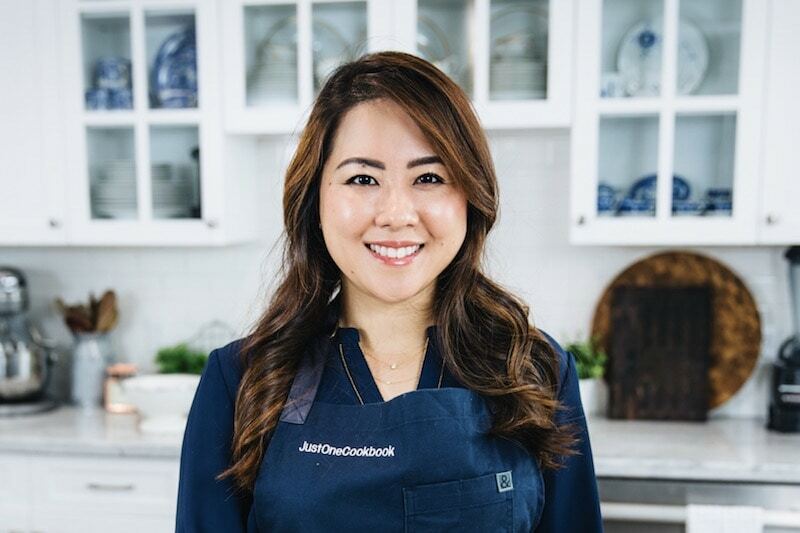 I hope you enjoy making this ginger pork onigirazu recipe! 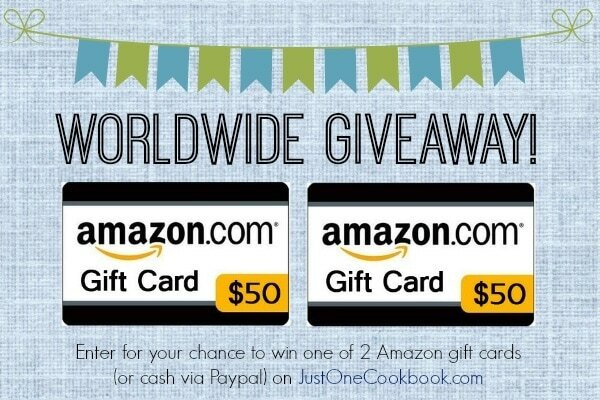 If you make this recipe, snap a picture and hashtag it #JustOneCookbook. I love to see your creations on Instagram, Facebook, & Twitter! Thank you so much for reading, and till next time! 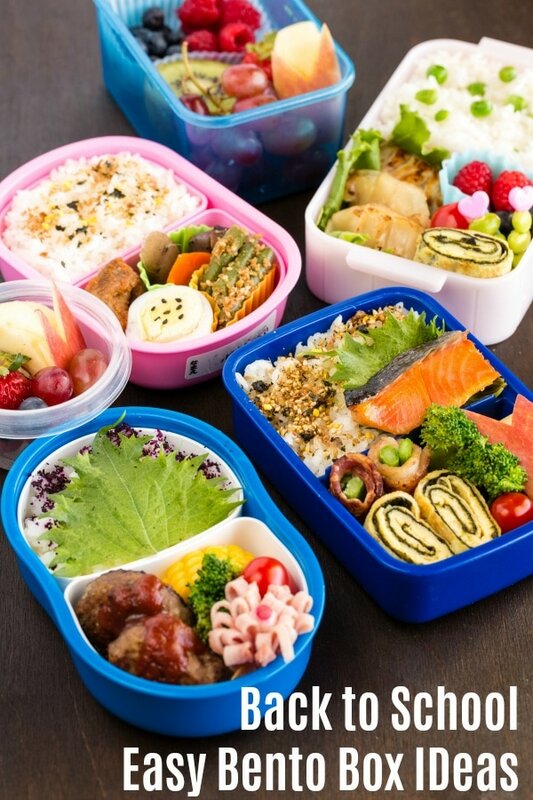 If you want to check out other bento ideas, read 15 Back to School Easy Bento Ideas & Recipes. 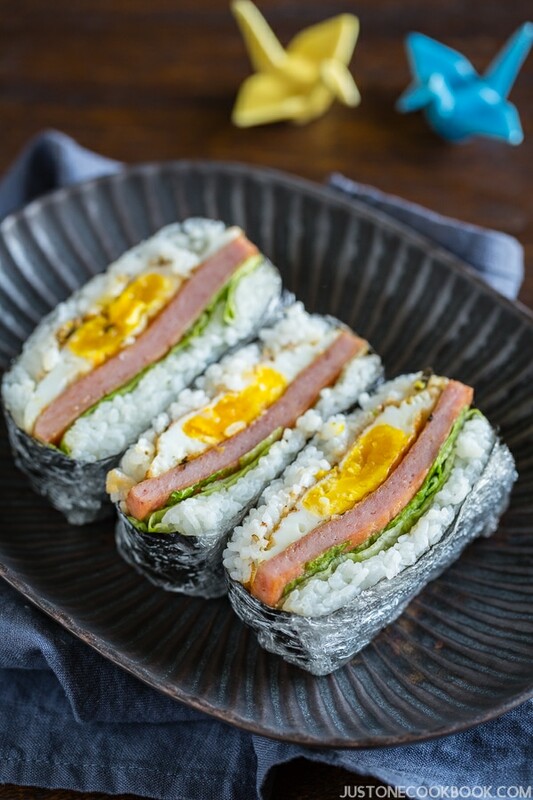 Tender thin pork slices with a hint of ginger wrapped between layers of rice and nori! 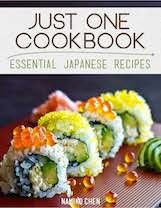 Place a plastic wrap on a working surface and put a sheet of nori seaweed on top (shiny side facing down). with a corner pointing up. For this recipe, I shaped my onigirazu by using an onigirazu mold; however, you can neatly layer the ingredients without one as well. 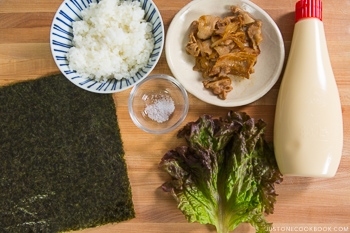 Evenly spread the steamed rice in a thin layer and form into a square/rectangular shape in the center of nori sheet. Sprinkle a little bit of kosher salt. Salt has 2 purposes for this recipe. First, it’s for adding flavor. 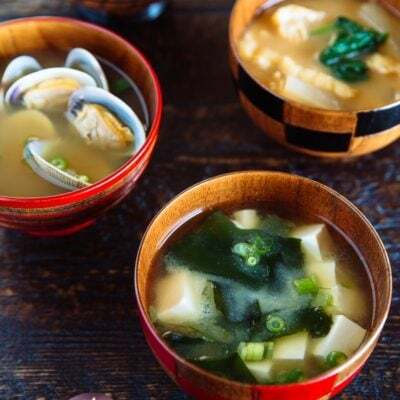 Secondly, salt is added to prevent the food from spoiling as we eat onigiri, onigirazu, and bento at room temperature, and typically without refrigeration. Place the lettuce on top of the rice and put some Japanese mayonnaise. Then put ginger pork on top. When you add the fillings, consider how you will cut the onigirazu later. 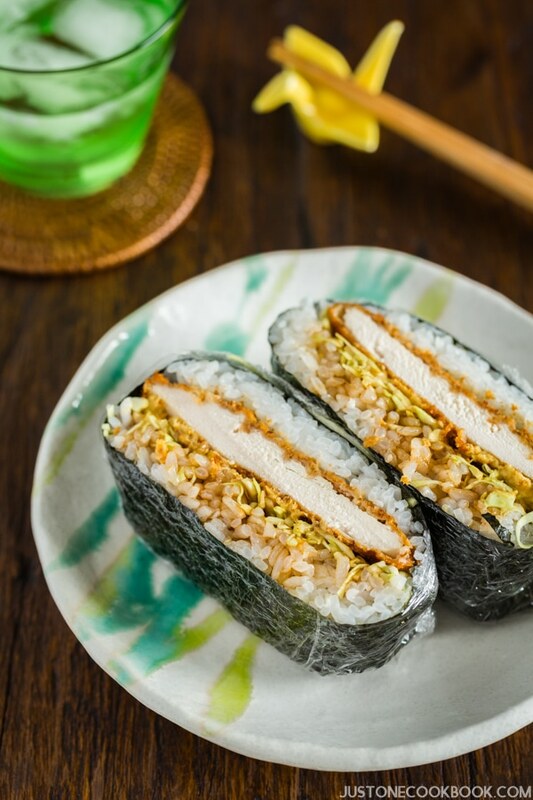 You want to arrange fillings so when you slice the onigirazu in half, the ingredients are revealed in a way so it looks delicious. 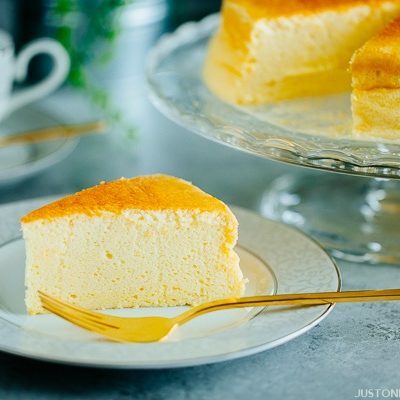 Place thin layer of steamed rice on top, maintaining a nice square/rectangular shape. If you have a onigirazu mold, moist the “lid” before you press down so rice does not get stuck to it. Place the lid on top and press gently. Pull up the mold carefully while pressing down the lid. If you’re not using a mold, make sure to stack the ingredients nicely. Bring left and right corners of nori sheet towards the center. 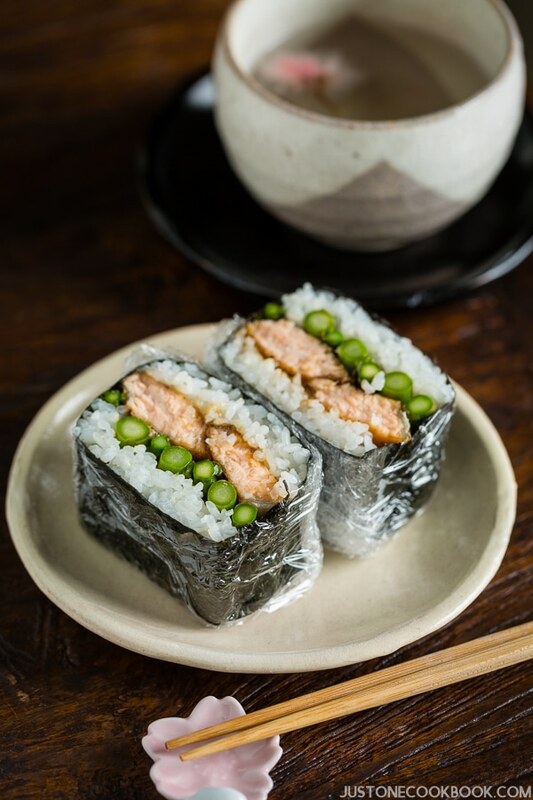 Fold gently but tightly to wrap around the rice and filling at the center. Then bring bottom and top corners towards the center. Continue to fold gently but tightly around the layers. Make sure the rice is tucked in nicely. 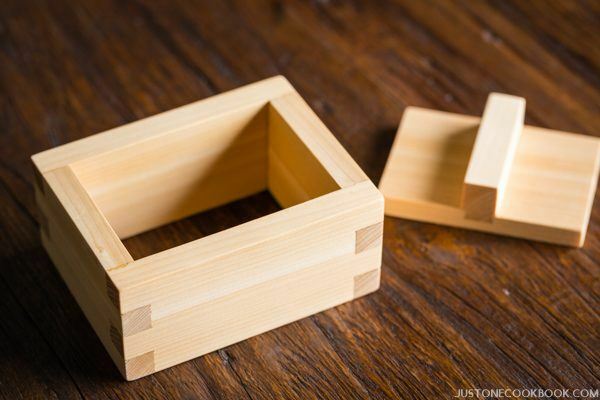 If your onigirazu is a square shape, you can mark the onigirazu with a rice kernel so you will remember which way you want to cut later on. Wrap tightly with plastic wrap. Set aside for 5 minutes with nori’s seam side down. After 5 minutes, cut the onigirazu with a sharp knife. Run your knife in running water before cutting so that the cross-section will be clean. If you plan to make this the previous night, wrap the onigirazu with kitchen towel and keep in the refrigerator overnight (with the plastic wrap on). The towel will prevent the rice from getting hardened due to the cold temperature. Eat within 24 hours. Love that mold! 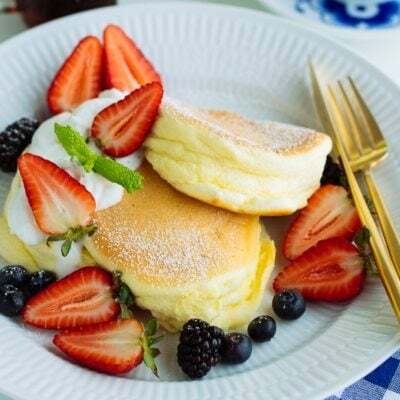 And love the dish, too — so pretty. Thanks! I was so happy when I saw this post, as I had been thinking of the very same thing – to make Buta no Shogayaki Onigirazu!! I love Ginger Pork too! 😀 Just wanted to ask, do we need to reheat the Onigirazu if it was prepared the night before? Or can we just eat as it is without hearing it up? It’s really up to you. If you keep in the fridge, I’d suggest to take out at least 30 mins to 1 hour before eating. Onigiri or Onigirazu are meant to eat at room temperature in Japan, not hot. If you eat it after taking out from the fridge, the rice can be cold and tough…. So I always suggest to wrap the onigirazu with kitchen towel and keep in the fridge so onigirazu doesn’t get too cold. 🙂 Hope you enjoy! I do need inspiration for my own lunch boxes! 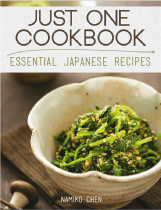 I have bought an onigirazu cookery book in Japan, but every experiment was just so messy…. I abandoned. I guess I must buy this wooden gadget! (A 101st item on my shopping list for the future trip!). Your onigirazu filling sounds fantastic. I am such a big fan of ginger pork… Thank you! I do love your ginger pork!! I’ve made it before and served it with a simple rice. 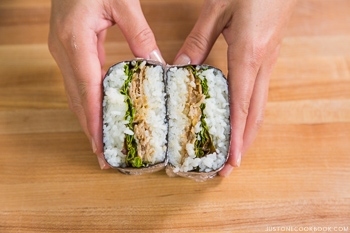 This sandwich looks awesome and even though I’m not a kid, I’d love one of these in my lunch box. Lucky kids you have! 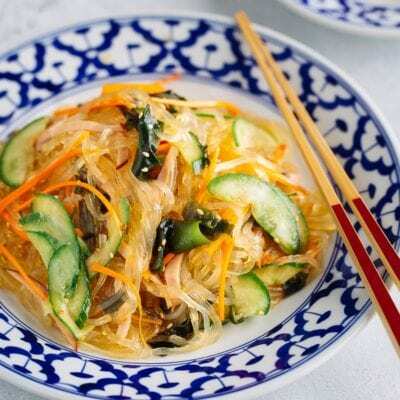 I have some leftover shogayaki so am going to make this for my family’ obento today! 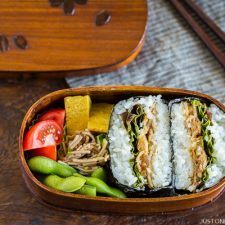 But I adore the 曲げわっぱ bento box you have! Every time we go to Japan I search for one like that but haven’t spotted ‘the one’. Did you buy that in Japan?